Winter is pruning season, the vines are bare and the vineyards are an austere view as their life flowed back temporaily deep into the soil. That's when you'll spot isolated workers doing the essential task of pruning, something which will determine in some extent the yields of the next harvest. Roughly, the pruning takes place from december to march, more or less depending of the weather and the availability of the winegrower, this is a calm season for him and he can usually choose his days without being bothered by other tasks except maybe the one of replanting or taking part to wine events. Pruning is not an easy job, as the weather in winter, while not extreme, is often humid, making the temperature feel colder than it actually is. I remember when I had Russian visitors once in november, it was a typical humid time in Paris and they really found the conditions very unpleasant (to the point that they caught cold) as in their continental latitudes the cold is dry and more bearable in spite of the largely subfreezing levels. While on a weekend in the Loire a few weeks ago I dropped at Clos Roche Blanche to see Didier work in the vineyard. This was saturday, and while Catherine goes to the marketplace of the charming town of Saint-Aignan nearby in the morning (I often stumble on her when I go there myself), Didier occasionally works between the rows. I drove straight atop the hill on the plateau after a short passage through the woods, leaving the manor-like house of Clos-Roche-Blanche on my left. I first missed Didier as he was far from the main dirt road and found a freelance worker indeed who was also busy pruning a block. Then as I was cruising back on the dirt road I spotted him. The vineyard looks more grassy than usual, especially under the vines, there has been lots of rain in the summer season and using the tractor was not always possible. Plus, using a blade right under the vine is always tricky and you can easily uproot an old vine by accident. The pruning on the old vines is a bit different Didier says, you have to leave longer canes otherwise you don't get grapes. He says there is some sort of a genetic program for a plant to produce a certain amount of fruit during its lifespan and the more aged a vine is, the less it yields fruit. You can't see it here on this picture, but there were piles of pruned canes between the rows iwaiting to be burned elsewhere, the bicycle here being Marie's who was busy pruning a few rows further in the parcel. Didier doesn't use electric shears, it's way too dangerous. He used a few years ago pneumatic-powered shears but that's also quite dangerous, after a few hours your attention is waning and in a millisecond you cut you fingers or a wire, the latter being less dramatic but then you have to change the whole wire which takes time and energy. Doing it at his pace with a traditional hand-powered tool is OK for him, he doesn't need to be on alert all the time, it's relatively relax, although Marie told me that pruning is one of the toughest jobs in the vineyard (you bend all the time). . The pruning at Clos Roche Blanche begins around november 15 and it can last until march. He doesn't really stop in the heart of winter except if the temperatures are really low, it's not about him, Didier says, but about the plant that could suffer from a pruning in these conditions (like minus 10 °C or 14° F) because the healing of the cut is much slower then. On the other hand, at reasonably cold temperatures like 0 °C (32 °F) you don't get any necrosis problem on the plant wound. Didier Barrouilet told me about a soil assessment he and Catherine had done in the vineyard last august, It's too bad I missed this as it sheds light on interesting issues that the French research institutes seem at last to take into account : Here, the INRA of Orléans (INRA for National Agricutural Research Institute) had a soil pit dug in two separate locations in CRB's vineyard. The INRA Unité Infosol which is based in Orléans is conducting this type of soil analysis on a regular basis not only in the Loire region but throughout France (they're in the process of making an extensive map of subsoils), and both under conventionally-farmed fields and vineyards and also on organic vineyards and also woods. They typically come with a team of technicians and dig a vertical pit to look at the horizons and subsoil composition. There's a similarity of approach with the one of Claude & Lydia Bourguignon who for almost 30 years have been highlighting the central role of the soil life and the horizons in the agriculture, although it seems to me the Bourguignons' approach is more whole and complete. Still, the INRA's analysis on these soil pits is yielding valuable information. You can see on this document (Pdf) both pictures of INRA technicians on the soil pits but also of the reports they produce at the end. One of the things the INRA is investigating is the difference in the soil between fields that have got deep plowing and the fields that have had only superficial plowing. It's been about 10 years that the INRA, after decades of inciting productivist agriculture, focused on the soil activity and also among other parameters, on the consequences of these ultra-deep plowings that were favored decades ago. The technicians dug two pits on CRB's vineyards, one here where the undersoil has never been returned, and another pit pit in another parcel which Didier & Catherine knew had been deep-plowed by the Catherine's grand-grandfather at the end of the 19th century, and although it happened a century ago, the humus horizon was still very shallow in this latter parcel, which means that deep plowing causes irreversible damages on the medium-upper horizons which are so vital for the plants and crops. Asked if at the end of the 19th century they could plow that deep (80 cm), Didier says yes, the could do it using a horse-drawn winch. In certain regions in that time, they used ox power, an even stronger animal which can rival our modern tractors except for the speed. I found the picture on the right on this page devoted to soil study. The first of these INRA pits was dug right among these rows, I was actually unknowingly standing above the place when speaking with Didier about the issue and he told me that by coincidence I was standing right where they had worked (after looking closer you could see indeed that the grass was kind of more recent or disturbed). They wanted to look at the soil horizons under here because this parcel had not had any deep plowing at the time it was planted 120 years ago, and the original layers (horizons) of the subsoil remained in place. By the way, up to this day, this particular parcel still bears these very vines which are thus (except a few replantings) about 120 years old. When we're speaking of deep plowing, Didier says that these are 80cm-deep plowings which really overturn durably the horizons. So, in this paricular parcel there has been no deep plowing, just probably a superficial scratching that left the horizons intact. The INRA guys found much-thicker humus horizons here (horizons humifère in French), which is good as this type of horizon has a stronger biological and insect life. A century ago, these deep plowing were also used for the purpose of making an underground draining, they would lie bunches of vine canes in the bottom of the deep plowings so that when leveled back the rain water wouldn't stagnate. Even after the shoots decomposed into humus, it would make place for some sort of underground stream that could evacuate the water (there was no heavy tractors then that could have compacted the soil). The original intent of deep plowing at that time was to put the humus-rich upper layers deeper down so that the roots could feed on them, but that was an error : in the undersoil there are organisms that like oxygen and others who don't stand it (aerobic and anaerobic) and when you do deep plowing you turn the two types of horizons upside down, putting the micro-organisms who like oxygen at a depth where they'll not find any, and vice versa. All this damages the microbiology of the undersoil. A century after the deep plowing, there has been a natural reconstruction of the upper layer but with very little humus compared to the vineyard that had no deep plowing. Plus, the deep plowing brought to the surface some clay that was originally lying underneath, and at the surface it hindered the natural life and interaction of bacterial/insect life with oxygen. Didier says that the other day he felt that the temperature was a bit cold, joking that they almost forgot how it felt to be cold, after three years without a real winter. At one point I also asked Didier about a problem thay affected many growers throughout France last year, the Susukii drosophila, a tiny vinegar fly that threatened dangerously the fruit in many areas. Hundreds of kilometers from here, André Durrmann told me that he had to speed the harvest in 2014 in order to save his grapes as the insect preyed on the slopes of Alsace. The fly looks for tender skins of ripe grapes, that's why it attacks the grapes around picking time. It drills a hole and lays eggs which hatch very quickly in the matter of 3 or 4 days. The babies then bath in sugar which is very good for them but makes the grapes turn into vinegar. Didier says that this insect wasn't around in France 5 years ago, it probably arrived here by plane from Asia, and the problem is that it came alone, read : without its natural predator that could have kept its extension in check. Its predator exists in Japan but not here yet, Didier says that it's a bit like for the Cicadelle that causes the Flavescence Dorée, another plague for the vines, the cicadelle came from another region of the world, the Great Lakes region of North America, and it also has its predator over there. There has been trials to introduce this predator of the cicadelle but it didn't adapt to the climate here. 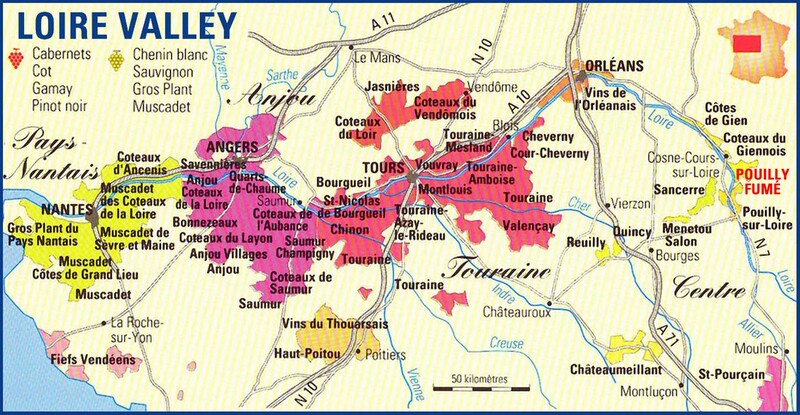 Cicadelle started in southern France, there are some here and there including in Burgundy (about 2 years ago) although these are still rare occurences, there has been a first case around here in the Loir-et-Cher, with just two suspected cases (two vines) near Oisly. they just took away the two vines. While the cicadelle stands cold temperatures, for the Suzukii a cold winter could do a good job and keep its spread in check, but lately the recent winters have been very mild. Didier says that the farmers who have strawberry fields have been hit by these Suzukii insects, especially when they grow strawberries for jam, because you have to pick the fruit very ripe and that's when the insects wreak havoc on the fields. Asked if there are remedies that are studied by the INRA or another research body, Didier says that as far as he knows there's no cure yet, but some growers resolved to spray sulfur on the vineyard before the picking in order to elmiminate the acetic bacteria, when usually they would leave the foliage free of sprayings for several weeks before the harvest. Conventional and organic vineyards are affected just the same, except maybe for the conventional domaines who pick the grapes when they're not ripe. It has also been observed that by picking on the day following a heavy rain, the grapes were washed enough to be free of the acetic bacteria. Didier says that on Clos Roche Blanche they still harvested ripe (there's no way they'd pick early and chaptalize), at least at the ripeness they usually pick, but he had to check the grapes arriving at the gondola, and with the sorting there are parcels where they lost half of the fruit load. They hadn't any problems on the sauvignon for this Suzukii fly for some reason, but all the other varietals were affected. He doesn't know why, it may be because sauvignon is the first to be picked and this doesn't fit the time window for the egg layings of the fly.